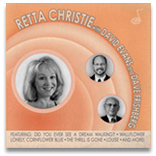 When I got a copy of Retta Christie’s new CD, RETTA CHRISTIE WITH DAVID EVANS AND DAVE FRISHBERG (Retta Records 002) I knew only one member of that trio — the redoubtable Mr. Frishberg. I put the disc on as I did that night’s dinner dishes — what could be more in the true American spirit than that? Now, I am a long-time musical elitist, taking this position early by my stated preference for jazz, not Gary Lewis and the Payboys. And my first reaction to the mention of “country and western” was to think of Buddy Rich’s quip, when hospitalized, that it was the only thing he was allergic to. So I was mildly suspicious of a CD that had “Ridin’ Down the Canyon” on it, and even Frishberg’s name didn’t entirely soothe me. But I was willing to give tnis CD a try — my friend Barb Hauser, the Sage of Bay Area jazz, often spoke admiringly of Retta — and much of the repertoire on it was more than reassuring. “Did You Ever See A Dream Walking?” has a fine pedigree (I know Bing’s record by heart, and I am looking forward to John Gill’s version for Stomp Off). I had listened to a fair amount of Thirties Western Swing, to the country-meets-jazz jamming of Butch Thompson, Peter Ostrushko, and others on A PRAIRIE HOME COMPANION, and the cowboy jazz that Jon-Erik Kellso and Matt Munisteri created in their group Brockmumford. When I began to listen to Retta’s singing (and her nimble, unflagging time — she plays brushes through most of the CD) I was charmed, entranced . . . . hooked. I was first attracted to the sound of the trio. As a soloist and accompanist, Frishberg is peerless. In one of his bits of memoir, he says that he would have liked to sound like Jimmy Rowles. Here, he often succeeds in his own way, never copying J.R.: Dave’s swinging waywardness, his way of finding melodies in corners no one would think to look in, his wry comedies (hear his commentary on “a coyote whining for hie mate” on “Ridin’ Down The Canyon”) are irreplaceable. I doubt that he will establish the Dave Frishberg School for Pianists — mail-order, with transcribed solosfor amateur pianists like myself — but I’ll sign up. I had never heard or heard of David Evans, but I see that my horizons have been woefully limited. His tenor and clarinet playing is loose, amiable, lyrical. I thought of Al Cohn, of Eddie Miller, of Lester Young — and not because he offers the listener a plateful of phrases they made famous. Evans knows how to purr, to muse, or to jump off the highest diving board, eyes closed, into a solo. When the two Davids explore “The Thrill Is Gone” and “Louise” in duet, the result is thoughtful, moving music. Backed by Retta’s neat brushwork, this trio sounded deliciously like Mel Powell’s Vanguard trios of the Fifties — particularly the one with Paul Quinichette, but also the session with Ruby Braff and the one lovely number, “When Did You Leave Heaven?” that Powell recorded with Jimmy Buffington on French horn. But I have intentionally left Retta Christie for last, as hers is the best surprise. When I first heard her sing, I thought her approach so artless that it seemed unadorned, as if the guitar player’s girlfriend had gotten up and sung her favorite number. But I seriously underestimated her singing. Its emotional directness and simplicity got to me fast. She doesn’t show off; she doesn’t insist on being the star. She has a speaking delivery, but it isn’t a matter of being untrained or unsophisticated. Rather, she wants us to hear the words because they mean something — and she delights in presenting the melodies as if they were beautiful and swinging. Which they are! 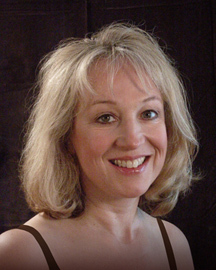 Without acting or overacting, Retta brings a rare tenderness to her material — Floyd Tillman’s “This Cold War With You,” “On Treasure Island,” as well as “I’ll String Along With You.” You will hear echoes of Patsy Cline, but also of Connee Boswell and Nan Wynn. And she can ride the rhythm on a swinging song — the rarely-heard “Lost” (lyrics by Johnny Mercer). I find myself returning to this session regularly, for its sincerity and wit — and I predict you will too. The disc is avaliable at Retta’s website (www.rettachristie.com), where you can also learn about her other recordings and live gigs, should you be in the Pacific Northwest. I never thought I’d find myself humming “Ridin’ Down The Canyon,” but I do, with pleasure. Thanks, Retta.